Just wondering if there is a point in reading that book. Because it is a massive big book, which will take quite some time to finish. Is there really that much in the book? Or would it be OK just reading summary or synoptic entries in Philosophy dictionary. Heidegger is considered a modern great philosopher. You will profit from grappling with his thought. But reading the whole book Being and Time give you any more benefit than just reading the summary of the book? It's a quandary as complex as quantum theory. My solution, mustering every quark of insight I could muster, is to read a summary or two of the many available to see if you want to read the original or parts of it. These are mostly free; books usually aren't. Start with free and work your way up. I read a much more accessible book on a similar topic,"Being on Time" by Heimatshunde. It specifically urges readers not to read "being and time" because you'll never be on time the whole time that you are reading that. The first tome is titled "Begin on Time", which is essential to understanding the workings that lead up to the second one in the series, "being on time". The author gave up after the second part of the trilogy was written, because he could not find another anagram (not even a dram of a nagram) to complete the series. This classic translates as Brown Spots on the Great Wall by someone relatively unknown to the West called Who Flung Dung. and everyone should remember his cousin who wrote the textbook about the Yellow river, Wee Pee Freely. I heard somewhere, or read on the Internet perhaps, that Wee Pee Free Li was a member of the Green Tea Party. One of my college professors (a Heidegger scholar) highly recommended this secondary source on Heidegger. A lot of "continental" philosophers respect him immensely, though he's been called a "charlatan" by some philosophers of the "analytic" tradition. Good luck in your pursuit. Being and Time is an utterly incomprehensible book to me. I have the above ebook but have not read it fully since I have so many other similar books to cover. In any case, in the preface Polt recommended some of his chapters should be read with the original B&T. Personally I believe one need to read the whole original B&T as many times as possible. I'd spent 3 month full time reading B&T. I believe I have grasped a general idea and central theme of B&T but perhaps only 40% of the full grasp of the details therein. From my reading with other secondary sources, Heidegger got lost with his question to find the question and meaning of the Being of beings [Thomas Sheehan]. But nevertheless all is not lost, Heidegger did uncover loads of useful and worthwhile theories related to human nature and 'being' along the way. I don't know. I mean, some of his allegories and/or analogies are sort of interesting, the idea of a person just going about his business hammering a nail and only taking pause to notice things more closely when the hammer breaks and how that maybe relates to the pursuit of truth and knowledge--just for it's own sake--without directed purpose. Or the notion of "framing" in our world in which everything is catalogued, organized, etc for the purpose of how it can be used, letting things "just be", and people as "standing reserve" for "world mobilization" and what not. And the general idea of an "authentic" existence is a very captivating one (as well as a prevalent and long running theme in philosophy). 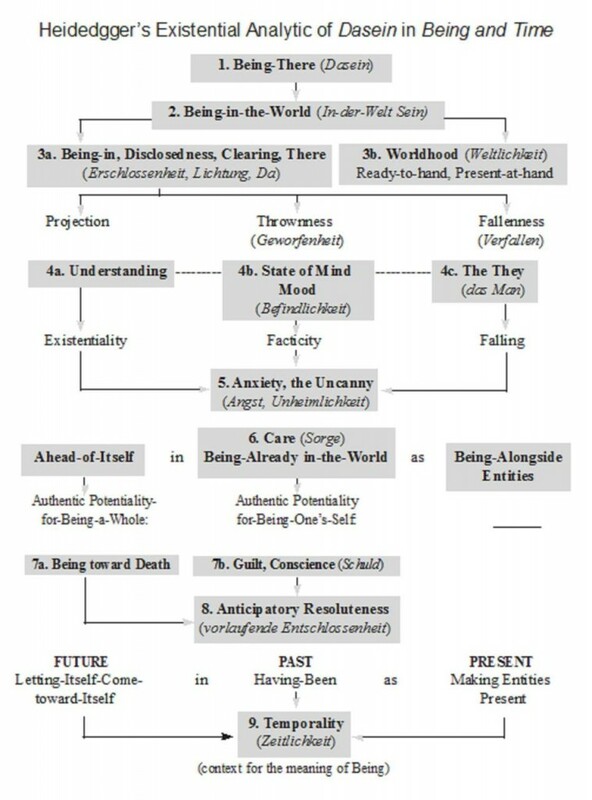 "De-constructing" the Western philosophical tradition to re-establish some better grasp of what it means to "be", or whatever. All enticing stuff. Overall, it seems at least pretty verifiable that he made a largely successful university career (compared to most) out of writing things that were for the most part incomprehensible to most but which those people nevertheless felt compelled to devote time and energy to read and listen to in spite of that vague and foggy understanding. It's truly amazing. Other than that, I'm about as lost in reading Heidegger as I am in reading the Upanishads. And yet, somehow every other human being on Earth who is not a Hindu manages to live and do meaningful things in spite of that profound ignorance of the Upanishads. I don't know. I mean, some of his allegories and/or analogies are sort of interesting, the idea of a person just going about his business hammering a nail and only taking pause to notice things more closely when the hammer breaks and how that maybe relates to the pursuit of truth and knowledge--just for it's own sake--without directed purpose. Or the notion of "framing" in our world in which everything is catalogued, organized, etc for the purpose of how it can be used, letting things "just be", and people as "standing reserve" for "world mobilization" and what not. And the general idea of an "authentic" existence is a very captivating one (as well as a prevalent and long running theme in philosophy). "De-constructing" the Western philosophical tradition to re-establish some better grasp of what it means to "be", or whatever. All enticing stuff. Overall, it seems at least pretty verifiable that he made a largely successful university career (compared to most) out of writing things that were for the most part incomprehensible to most but which those people nevertheless felt compelled to devote time and energy to read and listen to in spite of that vague and foggy understanding. It's truly amazing. Other than that, I'm about as lost in reading Heidegger as I am in reading the Upanishads. And yet, somehow every other human being on Earth who is not a Hindu manages to live and do meaningful things in spite of that profound ignorance of the Upanishads. I am not an expert on Heidegger. Nevertheless for the sake of discussion, here are my rough views. Heidegger in BT wrote: So first of all we must reawaken an understanding for the meaning of this question [of ‘being’]. to work out The Question of the Meaning of Being* and to do so concretely. the interpretation of time as the possible horizon for any understanding whatsoever of being. * can be Being of beings. In order to understand the Question and Meaning of Being of beings, Heidegger first looked at all the available discussions of meanings of Being of beings within Western Philosophy [he qualified and dare not mention Eastern]. Heidegger introduced the hermeneutical approach to study the Being of beings which cover all types of beings classified into human-based [Dasein] and non-human-based beings. In the case of the hammer like all other non-human-based beings [sciende], he stated we take for granted and do not differentiate between the ontic being and ontological being of the hammer. Heidegger emphasized the most effective approach to understand the Being of beings is via the human-based being, i.e. Dasein. One point to note is Heidegger defined ontology of being not on a substance-theory basis. The most useful 'keeper' for me within B&T is his concept of Angst.